Grains are mixed near the break with wheat and corn seeing some pressure, wheat down a penny and corn down ½ cent. Beans are up slightly. Ukraine's national railway operator Ukrzalyznytsya has restricted grain shipments to the country's major sea terminals in the Black Sea ports of Odessa and Mykolayiv, Ukrainian online grains newspaper Zernovoz stated. NCGA is asking USDA Secretary Sonny Purdue to change rates for he second round of MFP payments. This request pertains to payment for corn farmers that endured losses due to trade disputes. The Trump administration on Tuesday said that China has failed to alter its "unfair" practices at the heart of the U.S.-China trade conflict, adding to tensions ahead of a high-stakes meeting later this month between U.S. President Donald Trump and Chinese President Xi Jinping. 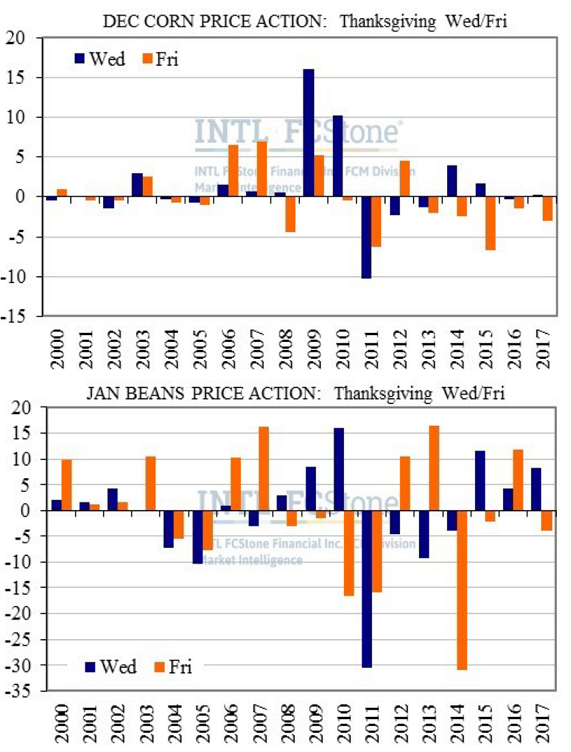 Today’s charts show price action of spot Dec corn and Jan soybean contracts, for the day before and day after Thanksgiving, since 2000. The last six years have produced an average move of less than two cents either way in corn, on the day prior; that number sky-rockets to just over three cents on the day after Thanksgiving, with corn posting five straight losses coming into this year. Bean moves pre– and post– shoot up to an average of seven and almost 13 cents (thanks to 2014), respectively.